For many businesses in many parts of the country, at least some of your business’s hours will occur after the sun goes down or before it comes up. For many businesses, such as restaurants, retail outlets, and service companies, these hours in darkness can run much later. Either way, highlighting your business and your landscaping at night won’t only turn heads with curb appeal, it’ll also help contribute to the safety of your clients, employees, and the security of your business. 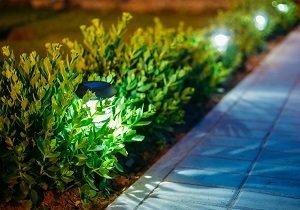 Let’s look at using landscaping lighting as a tool of your business. Your business’s appearance is its own form of advertising. If you’re putting time and money into improving and maintaining the exterior of your business and its landscaping, shouldn’t you be showing that off regardless of the time of day? Not only can you use flood and spotlighting to keep your signage and logos bright throughout the night, but also highlight elements of your building and landscape; including hardscaping such as walkways, fountains, and more. This lighting can also help clients navigate your business at dusk or at night to avoid injury or getting lost. Of course, this safety extends past your clients. Providing exterior lighting is also a great consideration for staff. Make sure night staff such as security, cleaning, freight, and other after-hours staff can make it around your building to do their jobs and avoid injury. This is especially true if you’ve taken tips from our Transforming Outdoor Spaces for Your Employees blog to heart and want to make these spaces available through the seasons and times of day. Lastly, darkness is still the greatest tool of any thief. We’ve touched on this before with home landscape lighting for security, and many of the same points apply here. While loss prevention or security is great at stopping those inside a building, the right exterior lighting combining landscaping lighting to discourage and motion-activated spot lighting to deter can be a potent tool alongside standard security systems and cameras. Landscaping projects, lighting, and maintenance of your commercial property is key. If you’re interested in pursuing commercial landscape lighting, development, and grounds maintenance with an eye for aesthetics as well as functionality, contact Greener Horizons. Experts on both commercial and residential projects, we can help you meet your goals to you, your community, clients, employees in your landscape development and grounds keeping. Contact us today to learn more and make sure to check out our other blogs on commercial landscaping, including The Importance of Landscaping Commercial Property.